More book recommendations from artists and us. “Americans were late arrivals in the field of tapestry weaving, which may account to some degree for the fact that the American tapestry weaver is less bound by tradition than his European colleague. His historical background, however, is probably the major factor. He projects into his work some of the dynamic exploratory spirit and inventiveness that are part of his pioneer past. 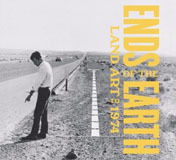 He feels free to investigate, to challenge old established methods, and to extend the many possibilities of his medium. Furthermore, instead of undergoing the discipline of apprenticeship, he is in most instances trained in the art and craft departments of universities. Exposure to the entire field of art, its interaction and overlapping, results in a broader, more sophisticated attitude…. Born and educated in Germany, Ms. Kaufmann studied fashion and design, textile design under Lili Blumenau, rug-weaving with with designer Margit Pardo, and tapestry weaving with renowned artist Martta Taipale of Finland. 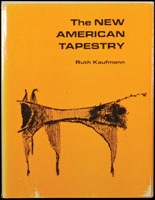 In 1968, Ms. Kaufmann was one of the American tapestry weavers who exhibited with American Craftsman, Inc. in New York. In 1969, she opened the Ruth Kaufmann Gallery in New York. It’s that time of year again. Over the next few weeks, we’ll offer a wrap up of books that the artists, clients and staff of browngrotta arts have been reading and thinking about this year. Ane Henricksen wrote us about Dr. Jessica Hemmings new book, Warp & Weft: Woven Textiles in Fashion, Art and Interiors. The book has six chapters: “Threads,” “All Kinds of Light,” “Dynamic Responses,” “Sound,” “Community” and “Emotion.” Described by its publisher as, “[a]n excellent resource for everyone with an interest in modern, woven textiles,” this book features work by Nuno, Ane Henricksen, Grethe Sørensen, Lia Cook and many others. 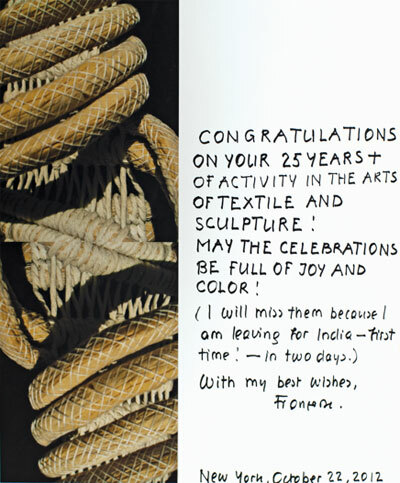 Earlier this year, Françoise Grossen sent bga these congratulations on our 25th anniversary. Grossen’s remarkable contributions to the field predate ours. In 1972, her work was featured in, “Rope Art: A new form fit to be tied,” in Life Magazine in an article on the exhibition Deliberate Entanglements. “Françoise Grossen, a Swiss better at knotting than entomology, concocted a 20-foot Inch Worm” the magazine wrote. “Some viewers at New York’s Museum of Contemporary Crafts thought it moved.” (Life Magazine, December 1, 1972, pp.86-90). This year, Grosssen’s work, Ahnen Galerie, 10 braided bundles of dyed manila rope with appendages, 13 x 116 x 92 inches, was acquired by the Racine Art Museum. 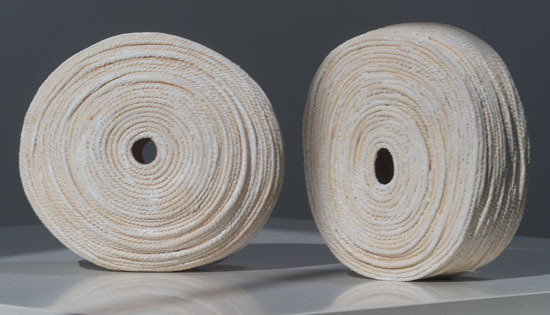 Ahnen Galerie is now on display in High Fiber: Recent Large-Scale Acquisitions in Fiber, http://www.ramart.org/content/high-fiber-recent-large-scale-acquisitions-fiber, at the Racine Museum of Art through January 20, 2013.